This is the story of the Ploesti raiders, shot down on a mission to Romania. What separates it from other stories is that top turret gunner Bob Johnson became one of a small group of Allied prisoners in Bulgaria. 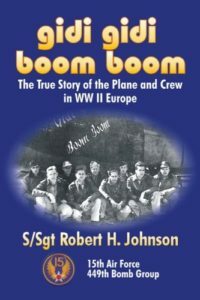 Johnson describes in gripping detail the attack of Messerschmitt fighters that shot down his plane, even including the statement of one of the Bulgarian pilots who shot him down. He recounts life at the hands of his captors and his transfer to the POW camp at Shumen. With little food and limited to one quart of water per day for drinking and hygiene, living in cramped conditions, infested with bugs and lice, denied proper medical care for the sick and wounded, and sleeping on bare concrete, Johnson and his fellow airmen survived. Johnson provides a first hand account of the release and his first taste of freedom, culminating in a train ride through Bulgaria, Greece, Turkey and Syria, and a plane trip to Egypt. Most stories would end here, but Johnson tells the rest of the story, of the secret mission to Bulgaria after the prisoners’ release, in search of Bulgarian war criminals who had brutalized some of the American airmen. This isn’t just another war story. Carefully researched, with supporting documentation, it is an inspiring account, part of our American history that is not commonly known, kept secret for many years.